Cucumber Eye Patches -- Ahhhhh! Whenever I think of a spa I picture women lying on lounge chairs by the pool with green cucumbers on their eyes! Lo and behold - it must be true! Although these cucumber patches aren't the real thing I bet they are just as good!... why? I have no idea... I'm just a shipping guy! See our great Cucumber Eye Patches HERE! Imagine yourself relaxing by the pool at a luxurious resort... would you rather be annoyed by your hard-to-place, falling towel or would you want to be lounging on a soft, plush surface? ...Obviously we all know the answer to that question. Boca Terry knows exactly what you need to offer your clients that feel of luxury. 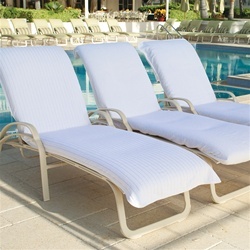 Boca Terry Lounge Chair Covers will give your clients a more relaxed and enjoyable feel as they are lounging poolside. There will be no worries about falling towels with the elasticized pull-over top. Another great perk to these lounge covers is that they are a universal fit! Meaning they will fit just about any chair! These Boca Terry Lounge Chair Covers come in Ecru or White and also have a White velour option. Lounge Chair Cover - Terry With Elastic Hood / Ecru by Boca Terry (Ecru) and Lounge Chair Cover - Terry With Elastic Hood / White by Boca Terry (White) are 100% cotton terry with hooded elastic top and cleaned finished edges hemmed on all three sides. 96" in length and 46" in width. (Fits most lounge chair covers). Lounge Chair Cover - Terry With Fitted Hood / Ecru by Boca Terry(Ecru) and Lounge Chair Cover - Terry With Fitted Hood / White by Boca Terry (White) are 100% cotton terry. Lounge Chair Cover - Velour Stripe With Fitted Hood / White by Boca Terry is 100% cotton velour with variegated stripe both with a fitted hood with cotton tape to finish off the edges. Fits up to a 30" width on a lounge chair. Your clients will relax all day in comfort with these lounge chair covers!